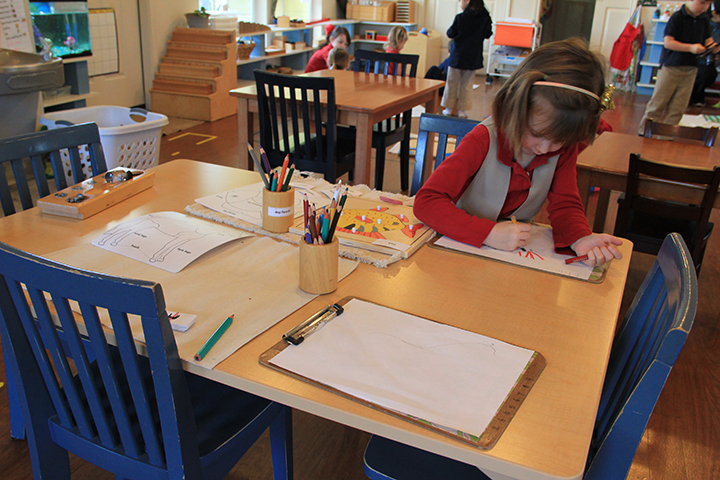 To enter a Montessori school is to enter a world specially prepared for the comfort and stimulation of the child. 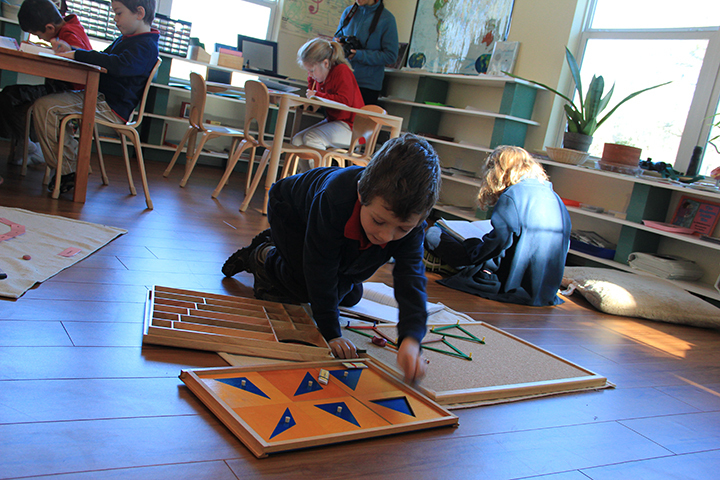 The classrooms are carefully designed environments where children of mixed ages work together or independently with multi-sensory materials that invite them to touch, to think, to experience. Children move freely about, choose an activity, work on it until a sense of accomplishment is achieved. Before the child chooses another activity, materials are put back in place. With the freedom to chose, children develop self-confidence, self-discipline and self-mastery. 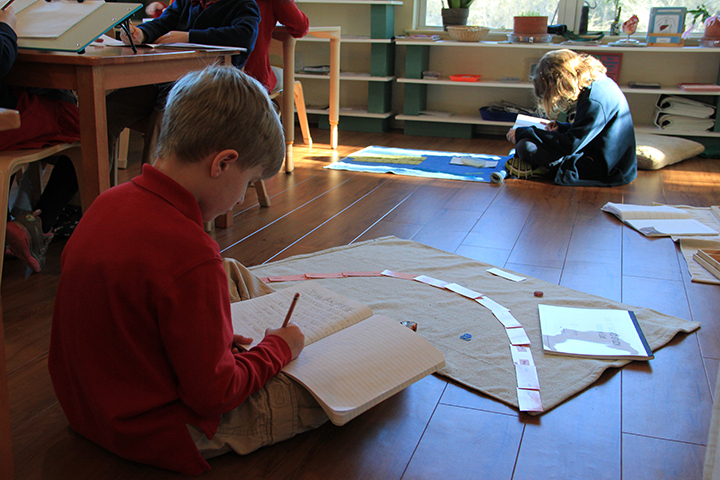 Because the Montessori classroom is child-centered, the Montessori teacher is more of a facilitator than an instructor. 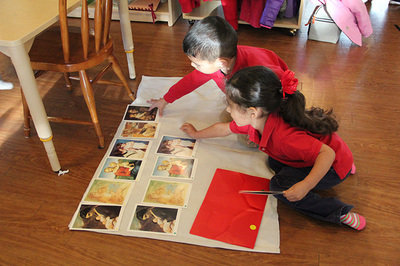 The teacher serves as the link between the student and the learning environment, observing each child’s progress, and introducing the next step to enable the child to master a skill. Multi-aged Grouping: Children are grouped in three-year spans with the same teacher all three years. 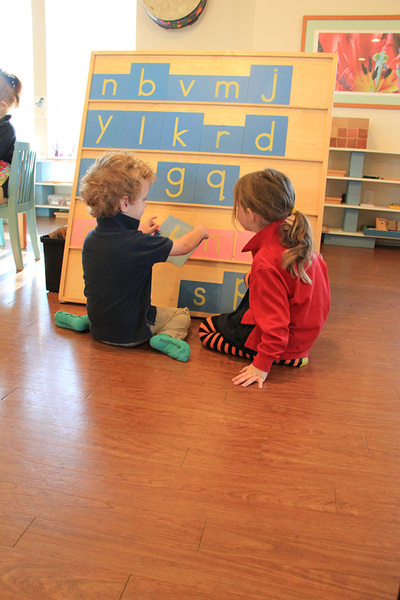 There is constant interaction, problem-solving, child-to-child teaching and socialization. The Human Tendencies: The practical application of the Montessori method is based on human tendencies—which Dr. Montessori studied in detail—tendencies to explore, move, share with a group, to be independent and make decisions, create order, develop self-control, abstract ideas from experience, use the creative imagination, work hard, repeat, concentrate, and perfect one's efforts and creations. 1. Be introduced to the concept. 2. Develop and grasp the concept through work, experimenting, creating, transforming. 3. Possess understanding of, and perhaps teach another, the concept. In Montessori the child is never asked to read or listen to a lecture (stage 1) and be tested (stage 3), but stage two is the most important and the longest, and it is the emphasis of developing, working, creating, transforming—a concept that enables the child to really learn. Indirect Preparation: The steps of learning any concept are well analyzed by the adult and are systematically offered to the child. A child is always learning something that is indirectly preparing him to learn something else, making education a joyful discovery instead of drudgery. The Prepared Environment: We keep in mind a triangle of the student, the teacher, and the environment. It is the role of the teacher to prepare, and continue to prepare, the environment, to link the child to it through well-thought-out lessons, and to facilitate the child's exploration and creativity. Observation: Scientific observations of the child's development are constantly carried out and recorded by the teacher. These observations are made on the level of concentration of each child, the introduction to and mastery of each piece of material, the social development, physical health, and so on. It is on this observation of each child that all of the teaching is based. Work Centers: The environment is arranged according to subject area, and children are always free to move around the room and to continue to work on a piece of material with no time limit. Teaching Method: The teacher is trained to teach one child at a time, with a few small groups and almost no lessons given to the whole class. 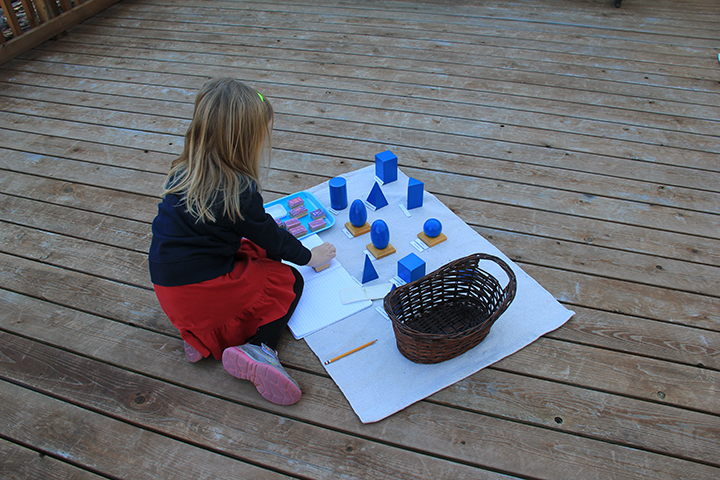 She is facile in the basic lessons of math, language, the arts and sciences, and in guiding a child's research and exploration, capitalizing on his interest in and excitement about a subject. 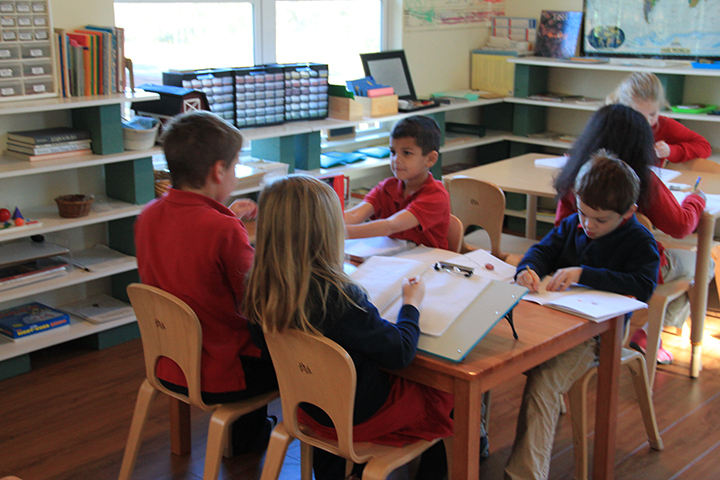 Large groups occur only in the beginning of the school year, and are phased out as the children gain independence. Class size: The most successful classes are of around 30 children to one teacher, with one nonteaching assistant. 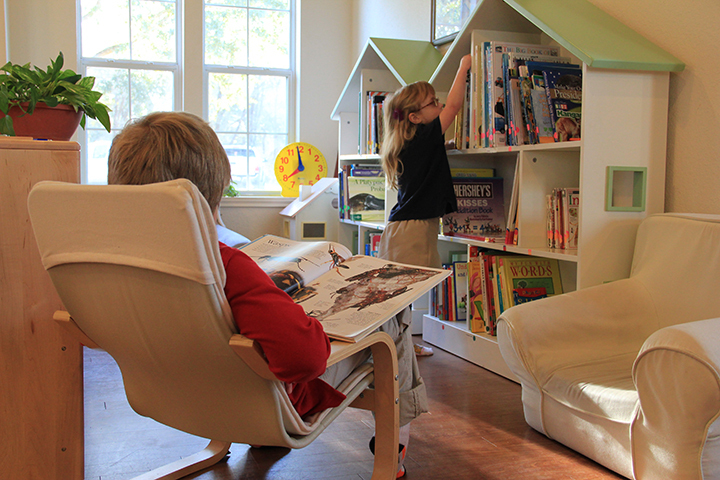 This provides the most variety of personalities, learning styles, and work being done at one time. 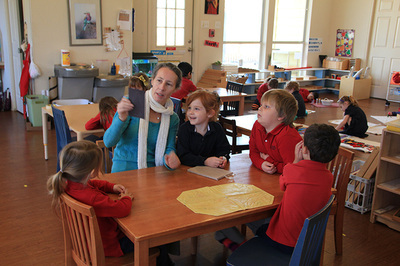 This class size is possible because the children stay with the same teacher for three years and much of the teaching comes from the children and the environment. Basic Lessons: Our teachers spend a lot of time during teacher training practicing the many lessons with materials in all areas. Teachers must pass a written and oral exam on these lessons to be certified. They are trained to recognize a child's readiness—according to age, ability and interest—for a specific lesson, and are prepared to guide individual progress. Areas of Study linked: All subjects are interwoven, not taught in isolation. The Schedule: Ideally, there are two two-to-three hour uninterrupted, work periods each day, not broken up by required group lessons or lessons by specialists. 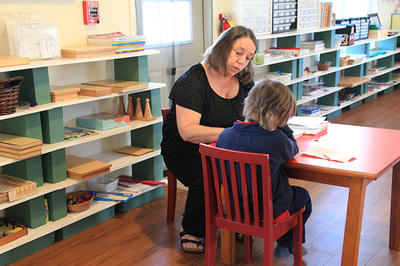 Adults and children respect concentration and do not interrupt someone who is busy at a task. Groups form spontaneously. Assessment: There are no grades or other forms of reward or punishment, subtle or overt. 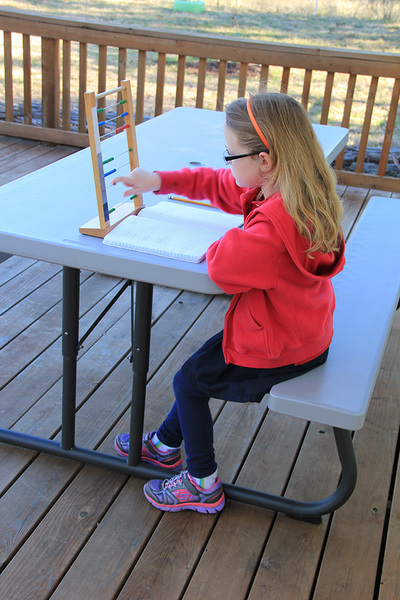 Assessment is by portfolio and the teacher's observation and record keeping. The test of whether or not the system is working lies in the accomplishment and behavior of the children, their happiness, maturity, kindness, and love of learning and work. Academic Requirements: There are no academic requirements for this age, but children are exposed to amazing amounts of knowledge and often learn to read, write and calculate beyond what is usually thought possible for a child of this age. Learning Styles: All intelligences and styles of learning—musical, bodily-kinesthetic, spatial, interpersonal, intrapersonal, intuitive, and the traditional linguistic and logical-mathematical—are nurtured. This particular is recommended by Harvard psychologist Howard Gardner in his theory of multiple intelligences. Character Education: Education of character is considered more important than academic education. Children learn to take care of themselves, their environment, each other—cooking, cleaning, building, gardening, moving gracefully, speaking politely, and being considerate and helpful. 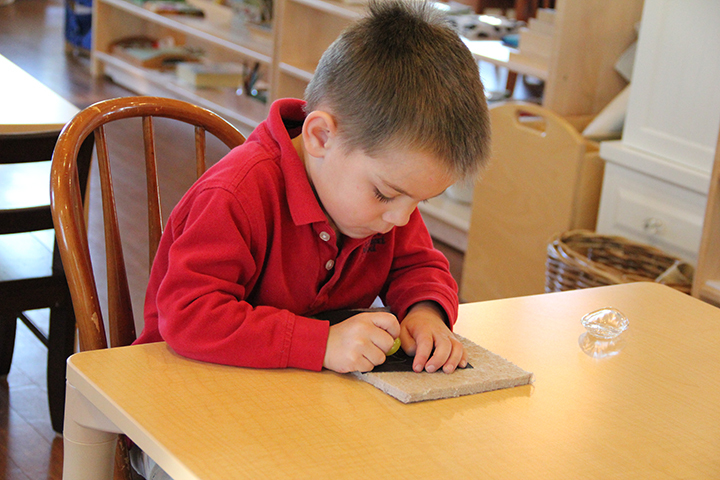 More than 100 years ago, Dr. Maria Montessori, an Italian physician, created a new vision of education for children, that is often thought of as the “education for life.” Montessori is a worldwide educational system founded at the beginning of the 20th century that is based upon a lifetime of research by Dr. Maria Montessori. Her philosophy is based on the natural development of children and their intrinsic desire to explore, discover, and learn from the world around them.